JayCorp Bhd is engaged in the business of investment holding and provision of management services. The company operates in five business segments which include Rubberwood furniture, Packaging, Processing of rubber wood, General trading and the Others segment. The Rubberwood furniture segment manufactures and sells rubberwood furniture. Its Packaging segment is involved in the conversion of corrugated boards into carton boxes. The Processing of rubberwood segment engages in pressure treatment and kiln-drying of rubberwood. The General trading segment sells construction materials. The Other segment comprises of the provision of transportation services, property letting, and printing. SuperPanda I buy evergreen first. Take profit then will come here. Jasper Coo Good stock, make huge profit ! SuperPanda Liihen rpt out. Higher qoq but lower yoy. So i expect this stock result will be not much different. value88 Many many export-oriented stocks will see higher EPS QoQ lah. This is mainly due to forex gain in Apr-Jun quarter vs forex loss in Jan-Mar quarter. The forex loss turns to forex gain can make quite a difference. 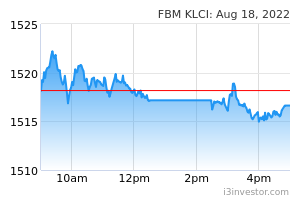 kfbusjd good profit this quarter, price should can go above rm1 right? YKLIEW Profit much better than last quarter. Declared dividend of 5 sen. Good roi of 5% even if price goes up to RM 1. Good potential. Yahoo..
frankco getting better.. looks at the capex reported this quarter.. higher growth coming for next quarter. Patrick13 Q4 result profit back to normalise with EPS 3.4 sen. Annual profit = 3.4 x 4 = 13.6 EPS multiple with 10 PER, fair value shall be 1.36. 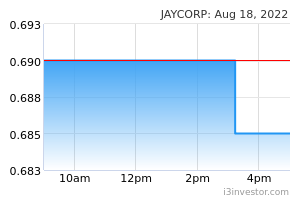 Share price still have rooms to go up if JayCorp can further boost export sales and improve cost efficiency. YKLIEW When are you going to pay us the 5 sen dividend? YKLIEW When la are you going to pay dividends? Patrick13 5 sen dividend payment date is on 28 Dec 2018. Good result. Profit is normalised plus strong performance from construction segment. Seems like furniture segment is getting benefit from trade war. Meanwhile Pohuat also announced the highest profit in the recent quarters. YKLIEW After ex date tomorrow, price will plunge. As per normal consequence. But I will hold shares for investment. Patrick13 The Company wish to announce that there was a minor fire incident at a factory owned by Jaycorp Trading Sdn. Bhd. The affected factory is located at JA 1880 Batu 22 ½, Parit Perawas, 77400 Sungai Rambai, Melaka. This factory is currently being rented out to Yeo Aik Wood Sdn Bhd. Both Jaycorp Trading Sdn. Bhd. and Yeo Aik Wood Sdn. Bhd. are wholly-owned subsidiaries of Jaycorp. The area damaged by the fire was restricted to a single finishing line within the factory with minimal impact to other areas of the factory. The fire started at around 8.40 a.m. on Sunday 23 December 2018 and was extinguished within 30 minutes. No major injuries were sustained. We have not yet determined the exact cause of the fire but we are in the process of carrying out the necessary investigations. A police report was made on the same day. The assets damaged include a finishing line, part of the factory roof, some spray guns, fire extinguishers and sprinklers. While further work needs to be carried out to ascertain the exact value of damages sustained, we roughly estimate that the total value of damage to these assets is in the region of RM500,000 to RM900,000. In addition, some work in progress (“WIP”) was also damaged. We roughly estimate that the damage caused to WIP is below RM100,000. In total, we do not expect the combined value of damages sustained by the fire incident to exceed RM1 million. All assets and WIP are adequately insured. We do not expect any major impact to operations as we have another finishing line facility which we are able to utilize while repairs take place. As such, although there may be some minor production delays in the immediate short term due to the damage caused by the fire incident, we expect to fully recover from this within 2 weeks. Please note that all values provided in this announcement are rough estimates. An additional announcement will be made once the exact value of actual losses has been determined. Patrick13 Buy at 0.87 today. 10bagger10 Can someone ask icon8888 sifu to come buy? you bought 30lot to make it have transaction Today? 10bagger10 Sifu yap, u sapu already? Growth If sapu impossible such low transaction. 10bagger10 Maybe sifu only bought a little? 10bagger10 Growth sifu got buy? Growth suddenly up 4% with volume,outstanding result announce soon? Growth wow!outstanding result with 3sen dividend! to be completed in the coming months and should contribute positively to the Group’s results. bid for more construction projects going forward. sengsoon 3 sens dividend is within expectation as good results will be coming in the next few quarters. anticipate total dividend distribution can be more than last year or may be 8 sens total in the financial year, it translates to about 9% dividend yield. if no fire happened in the end of last year, its result could be more better than now, don't miss it, good time to collect as it fully complies with KYY's rule. YoYo duduk diam diam makan dividen pun dah ok! ahbah Korrect, coming very fast ! freddiehero tomoro can fly high high? stock_investor told you all last month. if follow me, sure earn 20% by now. atika Y drop despite "good quarter"? Growth where is the volume,please push it up.